Squeeze Cages are perfect for vaccinating and examining animals. Simply slide the squeeze panel forward until the animal is firmly held between the panel and the side of the cage. The galvanized metal bottom can be removed for easy cleaning, the handles fold flat and lock into place for easy storage, and a sliding rear door is provided for the easy release of an animal. Our squeeze cages match up nicely to our traps with easy release doors. 305SQ Model 305SQ is a squeeze cage for cats, rabbits and similar size animals. 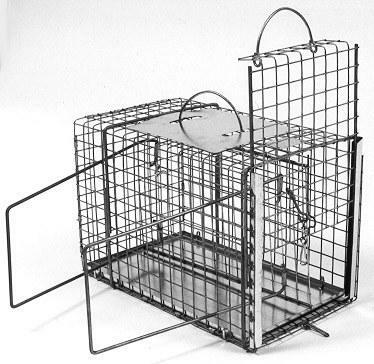 306SQ Model 306SQ is a squeeze cage for raccoons, cats and similar size animals. 307SQ Model 307SQ is a squeeze cage for small dogs and similar size animals.